Now that I no longer do a weekly TV show, I have more time to read my local paper. Sadly, that's The New York Times. The Times actually does some good reporting, but their political and economic coverage is filled with deceit. Can I find deceit every day? You bet. Take a look at a few days just last week. The front page: "NAFTA's promise is falling short, Mexicans agree." Wow, the Times now embraces Donald Trump's position on trade? Economists estimate that 14 million jobs depend upon NAFTA, but people everywhere often oppose trade because the smaller number of jobs lost is more visible than gradual gains. What evidence of NAFTA's failings does the Times offer? Oddly, the article says "the workforce has grown." Ah, hello? Job growth is good. Jose Luis Rico "earns well under $10,000 a year." Not much by American standards, but good for Latin America, and the reporter mentions that Rico got "a handful of raises." Have you gotten "a handful of raises"? Despite NAFTA, the "gap between the nation's rich and poor persists." Duh. Trade doesn't eliminate wealth gaps -- it may increase the gap because the cleverest traders get rich. But since the poor gain jobs and wealth, too, so what? Finally, the clueless Times reporter quotes a Mexican politician and crony capitalist complaining: "Government has not established policies to protect Mexican businesses." But "protection" for some businesses is corporate welfare -- welfare for the rich. It hurts poor people by raising prices. The Times wants that? Maybe they're sucking up to Donald Trump and his friend Carlos Slim, Mexico's richest crony capitalist, and the Times' biggest shareholder. A front-page story smears David and Charles Koch. First, the reporter labels them "the ultraconservative billionaire brothers." Ultra? Why ultra? Why conservative even? The Kochs favor liberal immigration rules, gay marriage, legal drugs, ending racial discrimination in criminal sentencing, fighting in fewer foreign wars and getting rid of government bailouts and favors for businesses, including their own. David Koch supports higher taxes to reduce the deficit. Which of those things is conservative?! Maybe the Times calls the Kochs "ultraconservative" because a political group they support points out, "Policies that subsidize electric vehicles and solar panels for the wealthy raise energy prices" and gas and oil are cheaper for everyone. The reporter adds that the group even showed a "video of people driving, turning on lights and plugging in appliances." Oh, no! How terrible! The reporter claims the "Kochs have long worked to quash ... renewable energy sources like wind and solar." But they haven't! They try to quash subsidies for renewables. Big difference. Doesn't the Times know the difference? The Times appeals to its Trump-hating readers with a headline that begins "Sensing Gains Ahead Under Trump, the Kochs ..." But the Kochs didn't give Trump a penny. 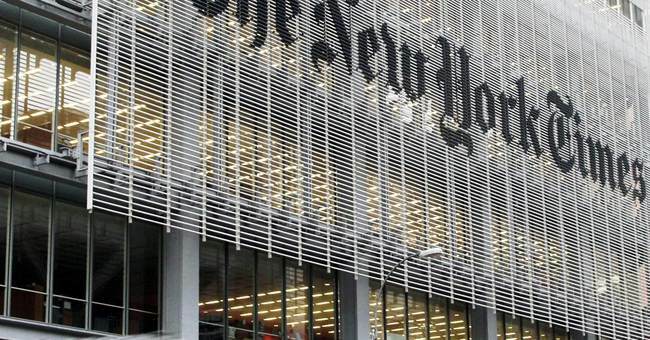 It's time for the Times to stop calling all their opponents "conservatives." Some of us are libertarians. America has other choices besides the anti-capitalism of the Times and anti-capitalism of Trump. The Times quotes left-wing New York Governor Andrew Cuomo saying it "defies common sense" to have a nuclear power plant near New York City. Green activists oppose the plant and Cuomo now says it will close. But where will New Yorkers get power? The "options include hydropower from Quebec and power from wind farms." Great. But what will we do when the wind doesn't blow? At least the reporter admits that "New York City could be burdened with higher energy prices." Could be? (SET ITAL) Will be! "Trump Denies Climate Change, These Kids Die." That's the headline on a Nicholas Kristof column about drought in southern Africa. Apparently, there were no dry spells before "man-made global warming." In truth, starvation has decreased dramatically thanks to fossil fuels. Starvation now is caused by corrupt governments, not climate change. If there's a way to blame capitalism even as it improves the world, the Times will find it.